Born in 1888 in Iowa, Henry Wallace would first achieve success as an editor before ultimately becoming one of the largest personalities of American political life in the mid-to-late 1940s. Wallace was educated at Iowa State College and took over his father's position as editor of Wallaces' Farmer when his father became secretary of agriculture in 1921. After becoming disillusioned with Republican farm policies and helping swing Iowa to the Democrats in the election of 1932, Wallace was appointed secretary of agriculture in his own right by FDR in 1933. Wallace gained national attention as head of the Agriculture Department, spearheading the administration of the Agricultural Adjustment Agency so successfully that FDR wanted Wallace for his running mate in 1940. As the most liberal member of the president's cabinet, seeking Wallace's nomination had the potential of dividing the party at the Democratic National Convention. However, when Democratic delegates seemed on the verge of disorder FDR dispatched ER (a staunch Wallace supporter) to calm them and lobby on Wallace's behalf. The speech that she delivered the next day was so well received that Wallace received the nomination on the first ballot, deepening a politically complex relationship with the first lady that would continue to evolve and change over time. Wallace distinguished himself as a loyal, hard-working wartime vice-president over the next four years, but still failed to recapture the nomination in 1944 when he was dumped by an increasingly conservative Democratic party. His 1943 speech in which he repudiated Henry Luce's vision of an "American Century" in favor of a "Century of the Common Man" had endeared him to left-liberals, but alienated him from rank-and-file Democrats at the convention. FDR wanted him to remain in the cabinet, however, and Wallace accepted FDR's appointment as secretary of commerce in 1945. He remained at the Commerce Department until September 1946 when he was forced to resign for having publicly criticized President Truman's foreign policy in a speech at Madison Square Garden. The left-leaning secretary had been troubled by Truman's rightward drift in foreign affairs throughout much of that year, regarding the president's militarism as a precursor to another world war. After leaving the Commerce Department, Wallace returned to editing, but this time at the New Republic, a liberal publication that he used as a platform for the Democratic party's left wing. At the end of 1946, Wallace went even further in his pursuit to advance progressive politics when he helped found the Progressive Citizens of America. Wallace's outspoken support of progressive causes made him perhaps the victim of more redbaiting than any other 1940s politician. Maligned as a communist sympathizer at a time when the American public was intolerant to socialism, Wallace's criticisms of administration foreign policy were increasingly out of step with mainstream public opinion. 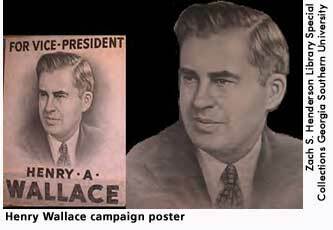 Recognizing that his chances at capturing the Democratic presidential nomination in 1948 were marginal at best, Wallace instead ran as the candidate of the Progressive party against President Truman, Thomas Dewey, and Strom Thurmond, but failed to capture any electoral votes. Wallace's break from the party also signaled the final break with Eleanor Roosevelt, his old political champion, who had originally wanted him to succeed FDR but increasingly felt uncomfortable with his "political naivete" and his desire to deepen relations with the Soviet Union. Wallace would ultimately reach a rapprochement with the Truman administration's foreign policy when he endorsed its firm stance in Korea, but shortly thereafter Wallace retired from political life and the Progressive party when it rebuked him for having voiced assent to the war. Wallace would continue to write about politics and agriculture throughout his retirement and until his death in 1965. Beasley, Maurine H., Holly C. Shulman, and Henry R. Beasley, eds. The Eleanor Roosevelt Encyclopedia. Westport, Conn.: Greenwood Press, 2001, 553-554. Black, Allida. Casting Her Own Shadow: Eleanor Roosevelt and the Shaping of Postwar Liberalism. New York: Columbia University Press, 1996, 44-45, 79, 132. Buhle, Mari Jo, Paul Buhle, and Dan Georgakas, eds. Encyclopedia of the American Left. New York: Garland Publishing, Inc., 1997, 596-599. Kirkendall, Richard S., ed. The Harry S. Truman Encyclopedia. Boston: G.K. Hall & Co., 1989, 383-385. The United States Senate: An overview of Vice President Henry Wallace's life and career.